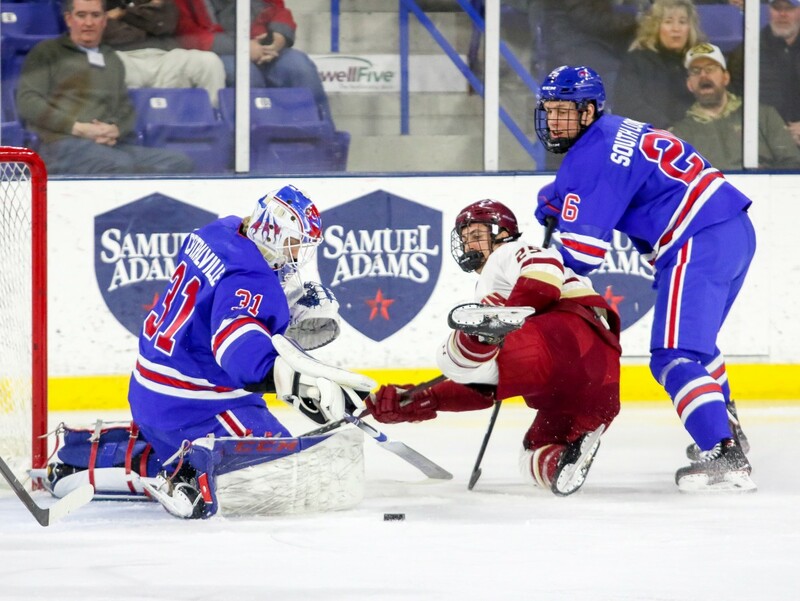 The Tsongas Center became a warzone as the Saturday night matchup against the struggling Boston College Eagles and the UMass Lowell River Hawks unfolded. Sophomore forward Charlie Levesque was handed a game misconduct early in the first period and a heated tussle midway through the third period resulted in four two-minute sentences for roughing. The intensity resulted in a hard-fought tied game and heightened emotions on each side of the ice. UMass Lowell’s character shined as it clawed its way back from a two-goal deficit at two points in the game. “They showed real heart. I liked our resolve tonight, and I thought if the game would have lasted one more minute I thought we would have scored the game-winner,” said head coach Norm Bazin. Senior forward Ryan Dmowski in particular showed heart in his inspired performance on the ice, leading all skaters with three points in the game. Dmowski tallied two goals, both in the third period. He had the game-tying tally at 17:59 that had fans roaring in the stands of the Tsongas. Dmowski was named the first star of the game for his efforts and elevated his season goal total to 10. Freshman defenseman Chase Blackmun, who had a big goal early in the third period, was awarded second star. Bazin remarked that although the game did not start the way he would have intended, he believed that the River Hawks played better in the second and third periods. The River Hawks entered the second game in the home-and-home series against Boston College coming off of a hot six-game win streak. Its home record was abysmal compared to previous years, 4-5-1 overall. It seemed as though there would be another loss to tack onto that statistic after the first period. Freshman forward Oliver Wahlstrom scored his sixth goal of the season at 8:44 in the first period, and a little over eight minutes later junior forward David Cotton scored to bring the game to 2-0. Heading into the second period, the mood was grim. The depressing first period coupled with the knowledge that UMass Lowell’s second period was notoriously shaky made for a potentially scary situation. Especially when one considered that the River Hawks were 0-4-1 when trailing by two goals in the 2018-19 season. Yet despite the odds the River Hawks came out swinging for a rollicking second period in which they controlled the offensive action. Junior forward Kenny Hausinger scored a breakaway snipe three minutes into the second. From there UMass Lowell embarked on a high-powered pursuit, chasing offensive opportunities with passion that spilled over into the stands. UMass Lowell tallied 15 shots in the second period while holding Boston College to a mere 5. Despite the great offensive control displayed by the River Hawks, Boston College scored once more to bring their goal total to three. Senior forward and Eagles captain Christopher Brown scored on the power play to bring the game to 3-1 heading into the third period. UMass Lowell fought back. Dmowski scored his first of two goals 1:15 into the third period and Blackmun followed up with his a little over a minute later. The game was then tied, and what ensued was a show of playoff-caliber hockey that had players on both teams fired up. Several skirmishes occurred after the whistles were blown throughout the game, with Eagles and River Hawks alike getting tangled up in each other. It was a contentious game from puck drop, with some of the drama surely being spillover from the previous night’s 3-1 win by the River Hawks at Conte Forum. Bazin says that much of the passion from the River Hawks came from the significance of the evening. UMass Lowell debuted throwback third jerseys modeled after former University of Lowell threads. There was a touching twist: instead of their own last names players had Lowell neighborhoods scrawled on their nameplates. The Tsongas Center’s PA announcer said before the game that the Saturday night Hockey East matchup was dedicated to the city of Lowell. Beyond that, Bazin said that the River Hawks hold a lot of pride in themselves which translated to their impassioned play. Despite the end result, Bazin could find few things to be upset about. “This feels like more of a win than a tie,” Bazin said. The River Hawks will travel to Northeastern on Friday, Feb. 1 for a game at 7 p.m. and will return to Lowell for the final game in the three-game series against Boston College on Friday, Feb. 8. Puck drop is scheduled for 7 p.m.